It is never all going to fit in . . . I have a 20k allowance to be checked in and my hand luggage won't be weighed. It is NEVER all going to fit in! I don't know when I will post again as I will be hopping about a bit down under but I hope to post at least once a week. I fly tonight - aarrghhhHHHHH! Next time I post I will be in Australia - Blimey! Fab friends and FAB work . . . The Divine Ruth Issett and the very wonderful Susan Chapman larking about on the Art Van Go stand. Ruth was demonstrating on the Art Van Go stand on Saturday and Susan's stand was opposite. The lovely Mr Mead from Art Van Go www.artvango.co.uk - we all ate so much ice cream during the show - it was clotted cream ice cream with real fruit and candy floss . . and honeycomb . . and raspberry pavlova . . . . and chocolate . . . and lemon crunch . 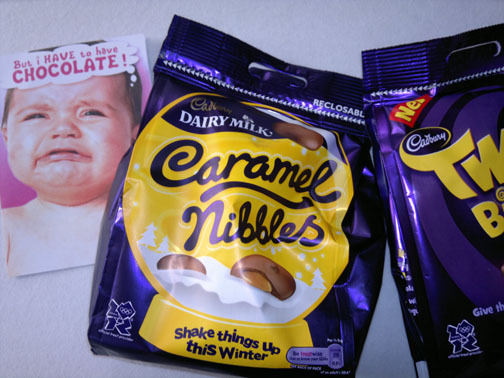 . . and toffee fudge and so many more. Over the four days we did our best to get through the flavours by having two scoop cones. The vote down our end of the show was that the lemon crunch and honeycomb were the best. 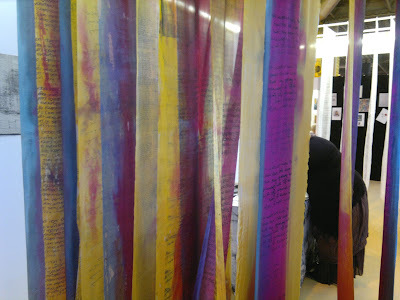 I will be teaching a 3 day workshop - The Journey, inspiration for art and design May 24th - 26th and another 3 day workshop - A new starting point August 29th - 31st in their lovely studio. I will also be holding a mentoring day on the 1st September for any ex students who wish to spend the day discussing your work and how to develop it. 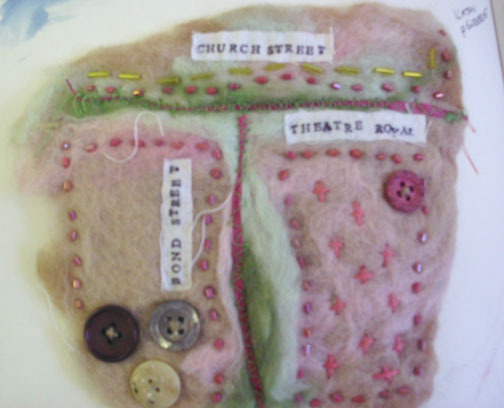 There will be time in the afternoon for stitch and play. Susan Chapman was exhibiting the beautiful work from her MA show. The work is based on how we are fast leaning on technology to communicate rather then using the written word and how the use of so much technology can lead to isolation. It was great to see Susan again, I will be see her again when I do my first lecture and workshop when I come back from my Antipodean tour in Winchester. Chris Gray from Mabon Arts shop.mabonarts.co.uk also had a stand at the show and also delivered a workshop in the Vilene Workshop every day. I just loved this large panel that was displayed on her stand. 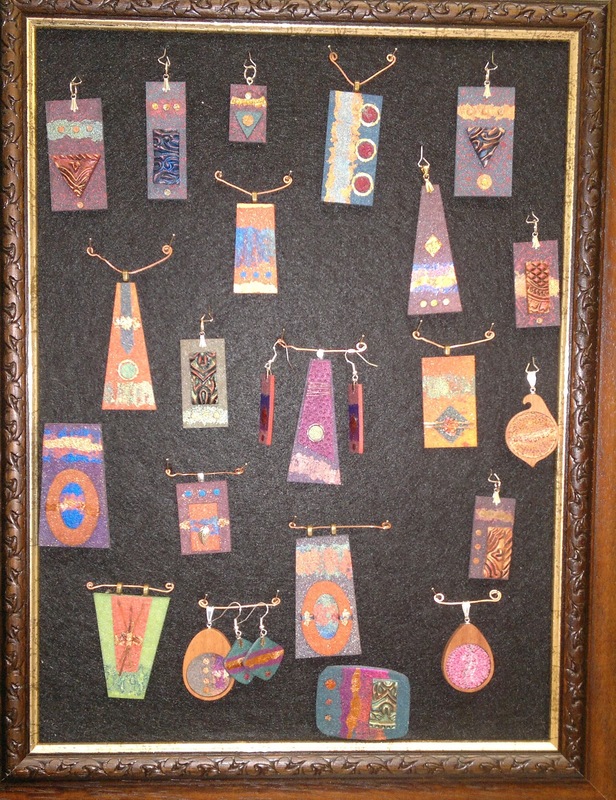 Just some of the pendants Chris has developed using heavy pelmet Vilene plus, heat transfer foils and painted Bondaweb. This image doesn't do justice to this beautiful hanging it is absolutely stunning. One of Jenny's fabulous collagraphs. I would have liked to show you so much more but the show was very busy and what with having to organise all the Vilene workshops and not having as much energy as usual I just didn't have a lot of time. It was great to see so many of you and have the chance for a quick chat. I couldn't have done the show without my 'minder' Jayne Routley, she was a Superstar. We will be driving down to Brighton this morning where she will help me unload the van and then I will deliver her to college where she will then teach her Monday feltmaking class - she is a very good friend and a great support. I will then return the van and walk to the doctors and get the prescription for the suitcase full of drugs that will keep me going in Australia. I am going to have my hair cut very short tomorrow, every time my hair moves it drives me mad, just the wind in my hair makes it uncomfortable. Neuralgia is a right PAIN!!! Lord knows what I will look like but sometimes it good to have a change. I will make sure I have enough fringe to dye it blue. There are many worse things, I have all my arms and legs and I am still breathing and all this will pass . . . . Thank you all for your kind words and advice. 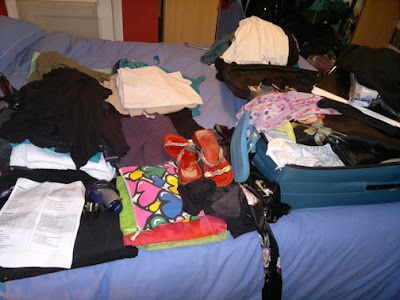 So - it is back to reality - the washing of clothes - final checks and then packing a much bigger suitcase, Lawkes a mercy me! I fly on Thursday!!!!!! aaRRGHHHH! It was wonderful to see you Jill and Tallulah - not long till July - Yeehaa!!! Two little girls eating ice cream . . . ! 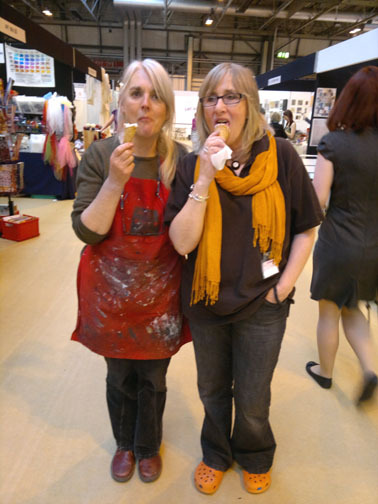 Bobby Britnell and Viv from Art Van Go eating the delicious ice creams we are all addicted to at the show. So many flavours to try and only 4 days to try them . . . .
We had another really busy day today - I didn't have time to get off the stand to take any photos, I will go in early tomorrow and take some. 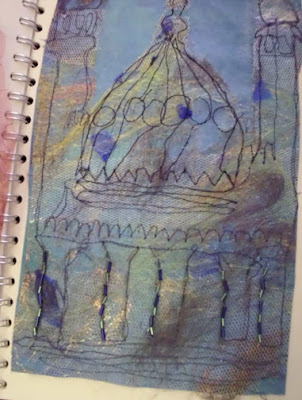 I don't get to see Bobby often enough but will be teaching my 'Print, Paint, Stitch and Play' workshop in her wonderful studios August 14th - 16th so I will be able to catch up with her again then. I love doing this show as so many of my friends are here and you always meet new and exciting artists as well, we work very hard but we do have a good time too - hence the photo! This is just a quick post - it has been a very busy day. 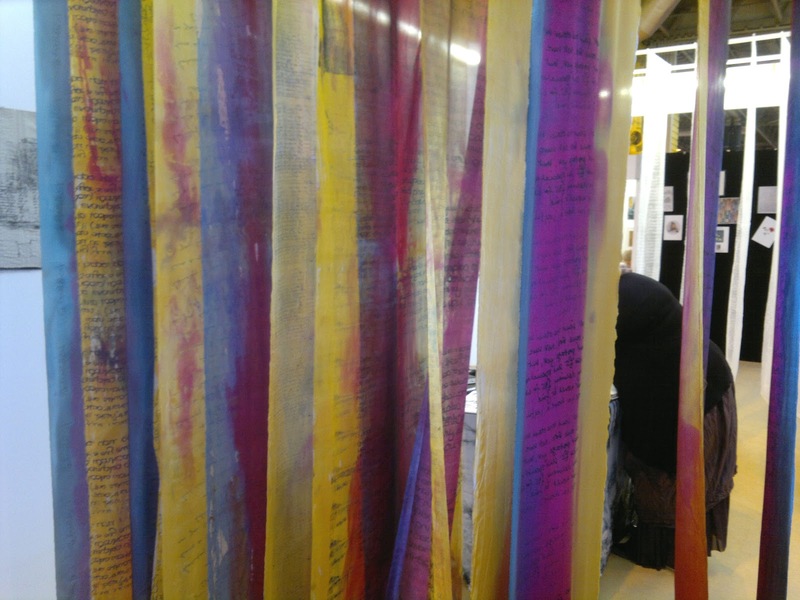 This show is SO good, such an amazing collection of textile artists, college stands, textile groups and so much more - I am so lucky to be there. It has been a great opportunity to catch up with friends that I haven't seen for a while - Claire Muir is one of them. 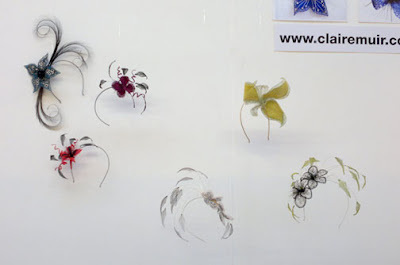 Claire's work is stunning - she creates the most beautiful corsages, headpieces, fascinators - what ever you need. 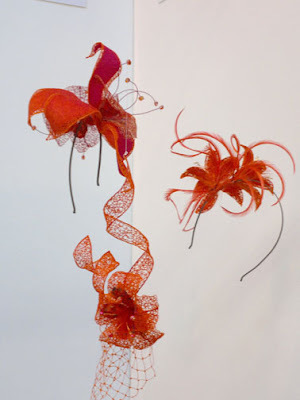 Most of Claire's work is for weddings and special occasions and made to order. 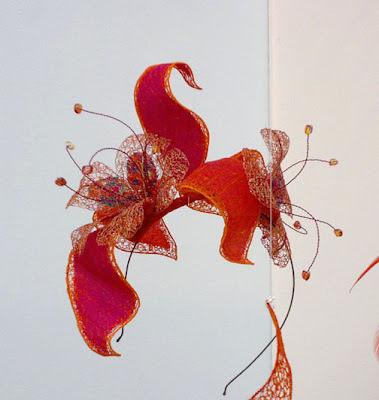 I was mesmerised by the exquisite work and the way she had displayed it on her stand. A little bit of what you fancy . . . ! Beautiful textures and subtle neutral colours plus an interesting collection of shapes. Well the stands are up and we are nearly ready - Jayne and I will go in early tomorrow to finish off. We came back to our guest house at 3pm and we were both so tired we fell asleep. We have just got back from having dinner in the local pub and are now packing up product in our respective rooms. Jayne is cutting up CS500 Spunbond ready for her workshop tomorrow in her room and I am rolling up single metres of Lamifix in my room. 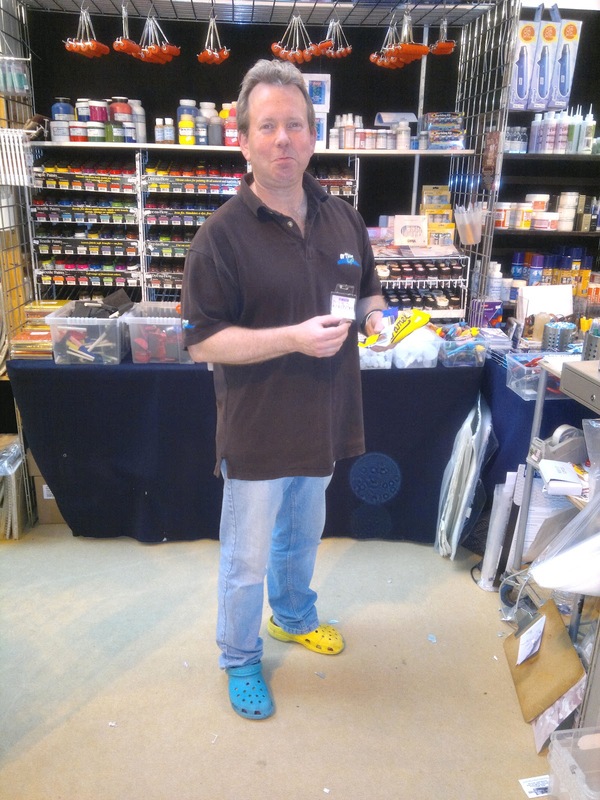 It is an annoying job as the Lamifix sticks to itself but I sell a lot of it and it is a fab product, so it is worth it. 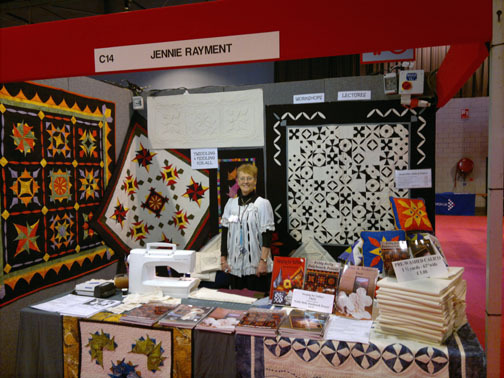 I am very lucky that Jayne has been able to take time off work to help me on the stand this year, she is an ex student who has turned into a great friend - she knows what I am like - and she still speaks to me!!!! I couldn't have managed on my own, I am still very tired and trying to keep the neuralgia under control - I have never taken so many drugs! 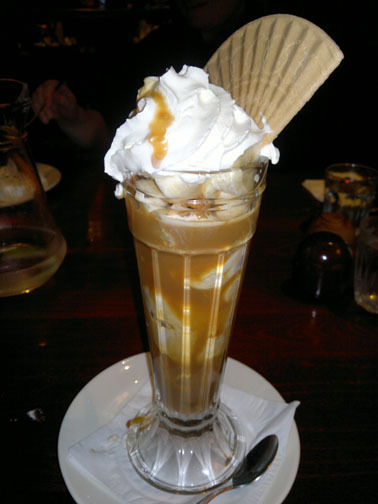 I did enjoy my banoffee sundae - I really felt I needed it - VERY naughty - but VERY nice! I will take loads of photos over the next few days to show you what goes on at the show - it really is the best. 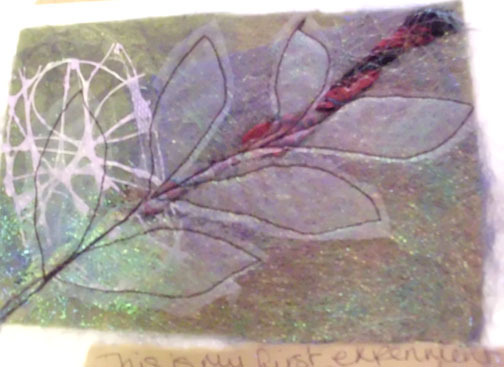 Kathleen Laurel Sage's first experiment using a soldering iron with Vilene Spunbond CS500 - she has now developed a very exciting new workshop. This time next week we will be exhausted after the 3rd day of Fashion, Embroidery and Stitch at the NEC. F,E and S as it is known, is one part of a three part show. 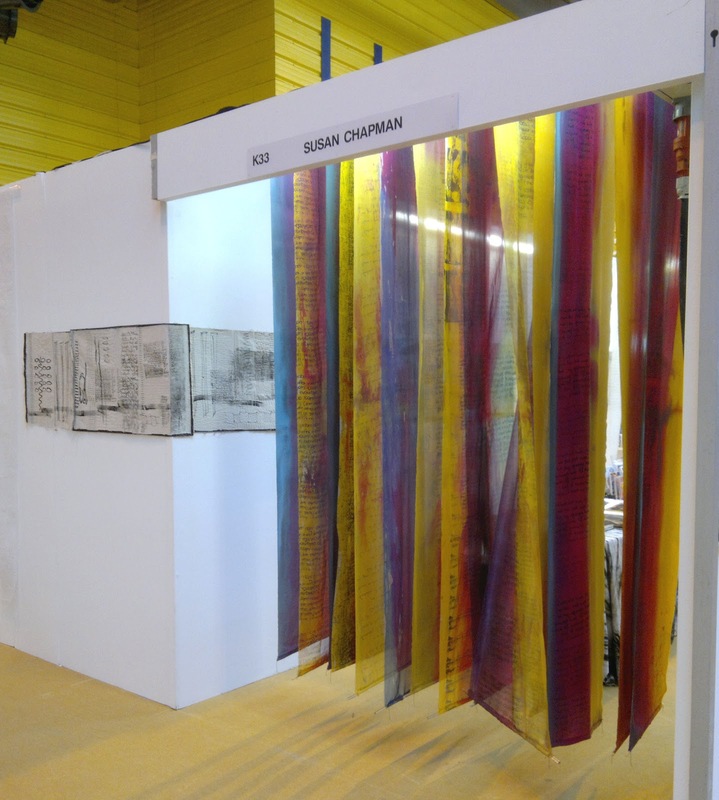 It is the more creative and mad side of the show with all the college stands, the amazing fashion shows and of course - wonderful textile artists and the best traders. 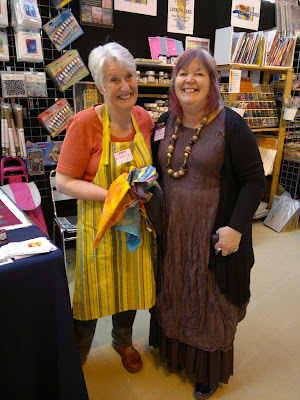 The two other parts of the show are Sewing for Pleasure which includes all the beautiful dressmaking side of textiles and then there is Hobbycrafts - all the traders you could possibly desire to supply your every need. 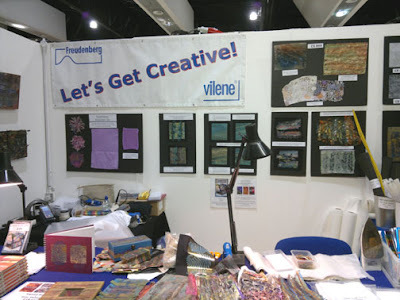 I will be running the free workshops again on the Vilene Workshop stand no Y01. We have an exciting list of tutors for you this year. There will be 5 free workshops in the The Vilene Workshop every day. one ticket per person so arrive early to avoid disappointment. ‘Fabulous Surfaces’ artist Lynda Monk will show you some amazing metallic effect surfaces using Pelmet Vilene and Vilene Spunbond along with various mixed media products. Come and play with creating these surfaces which can then be enhanced at a later date with hand or machine stitching, beading and other embellishments. 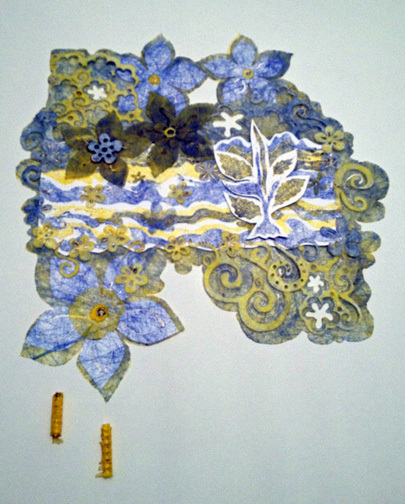 Come and play with old newspapers, painted Bondaweb and heavy iron-on interfacing to create beautiful brooches. 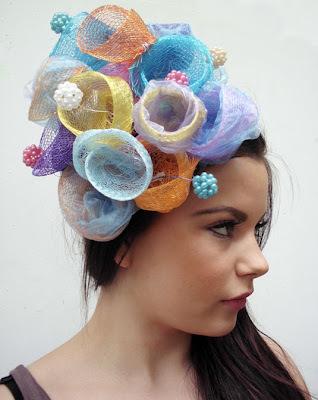 Using the very fine CS500 and CS500 crash Vilene Spunbonds along with wool tops, you will create a simple flower that would make a fabulous addition to a garment, bag or hat! We'll be making jewellery pieces from painted heavy-weight iron-on interfacing and Bondaweb...with a few polymer clay additions if you'd like to include them! 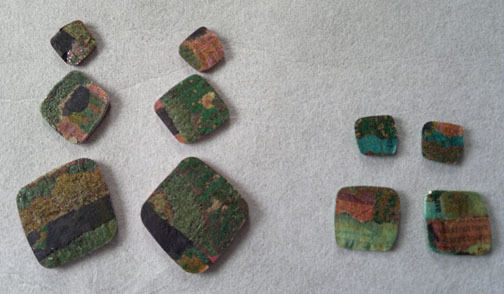 Materials available for pendants, earrings and brooches. All components prepared for you to put together and take away a stunning completed piece. 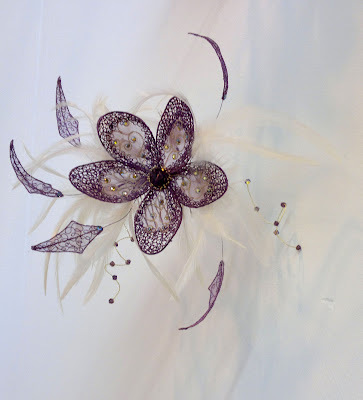 Demos on my stand J10 too! 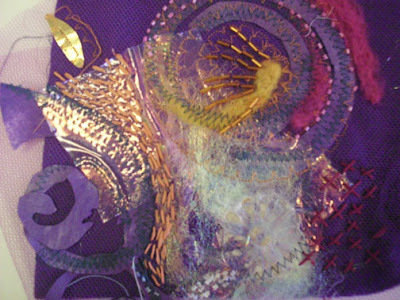 Collage paper appliqué using Vilene Spunbond CS550 in gorgeous colours using a soldering iron. 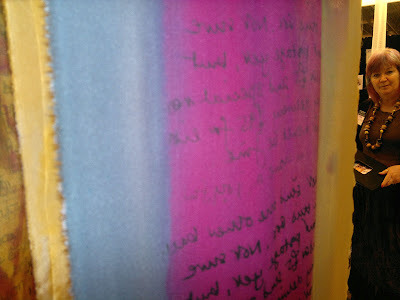 Your samples could be stitch embellished if there is time. 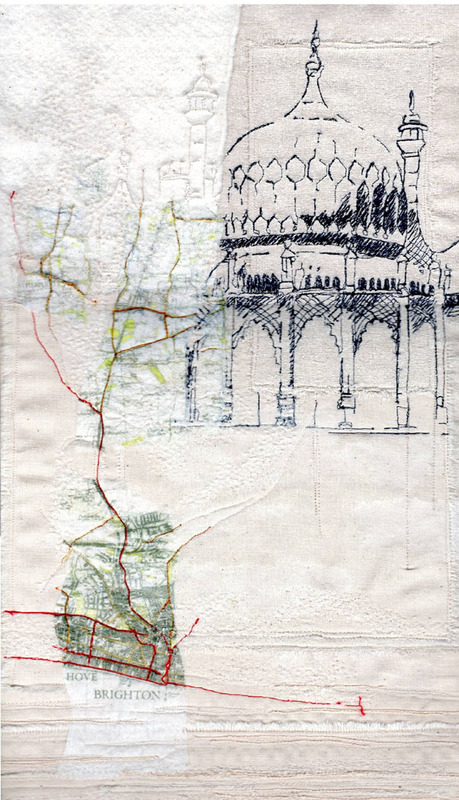 My saviour from the Glasgow show - Wendy Dolan will also be at the show with a new range of maps - her work is so sensitive, very beautiful. 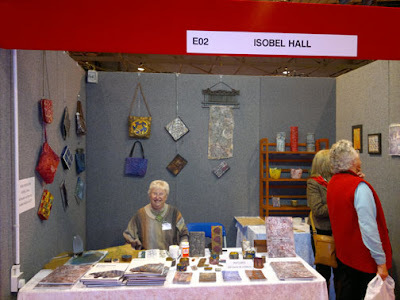 She will be opposite my stand (where she can keep her beady eye on me) her stand is K19. I am slowly recovering from the dreaded shingles, it is going to take some time but i will be O.K. to fly to Australia - Yippeeeee! I may not be QUITE firing on all cylinders, but that could be a blessing . . . . 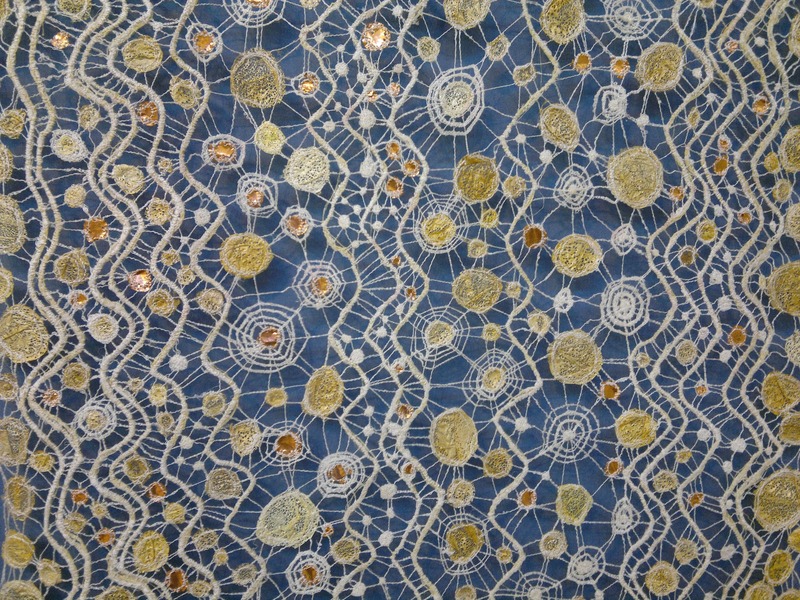 I am in the process of writing my keynote lecture for the Creative Fibrefestival in Blenheim, New Zealand - mine is the opening lecture - GULP!!!! 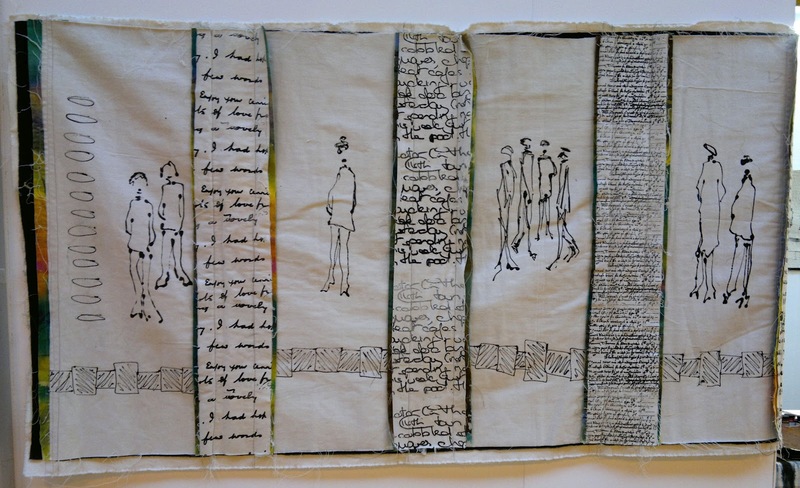 I have been asked to speak about design and I have been going through all my images of students work - I have spent a lovely 2 hours just remembering all the good times, traumas and great fun we all had - particularly on my course Experimental Textiles. 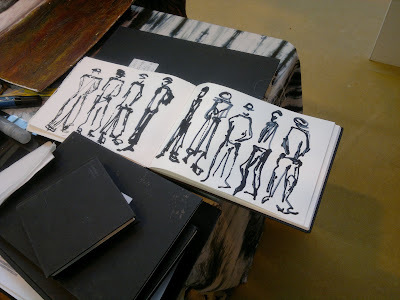 I was looking at all the sketchbook images and thought I would share these 2 with you. 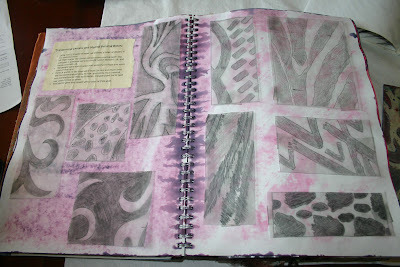 These 2 sketchbooks were created by 2 students at the Connaught Centre, Hove. They are sections taken from a design exercise I teach called 'The journey', it is featured in my book Experimental Textiles. 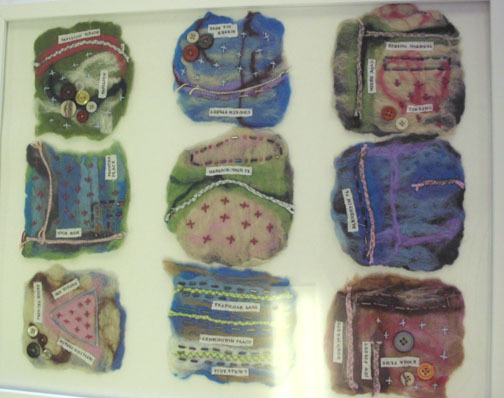 A selection of 'journies' painted by my students at Portslade Community College. Right! 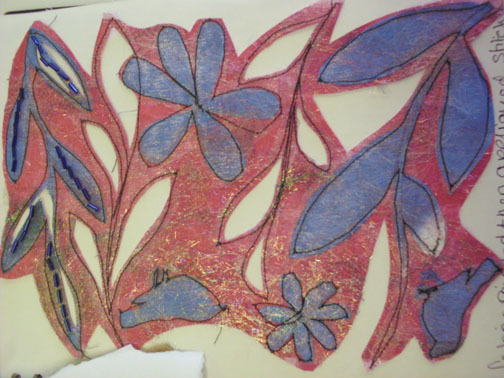 that's enough reminiscing - I must paint a load of Bondaweb and heavy pelmet Vilene plus for my workshops next week - then cut it all up and put it in 40 little bags - groan . . . .
One of Sarah's layered samples to show the students the kind of thing she was after! Sarah and her students have exhibited the collection several times and have now created something new - and they will be exhibiting it all on stand no N16 at Fashion. 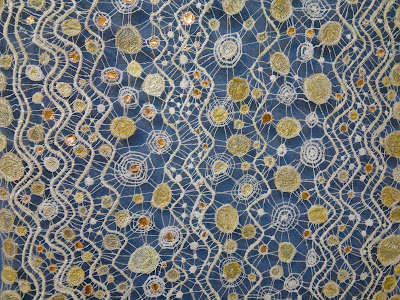 Embroidery and Stitch next week. 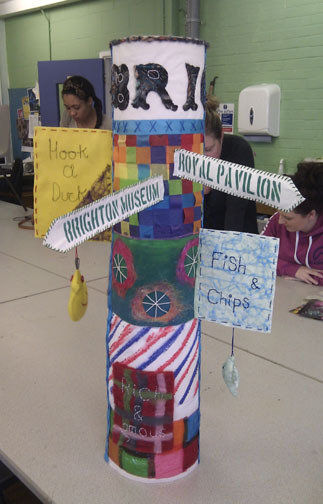 The work is based around Brighton. a simple experiment with layers and stitch - FAB! 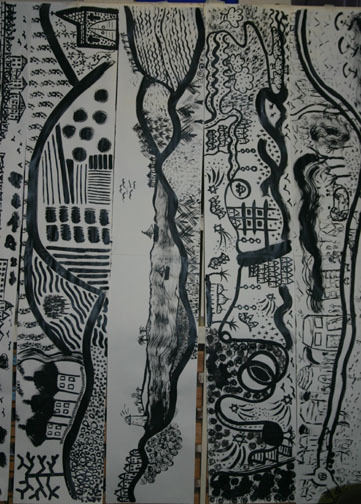 As you can see - there will be some gorgeous work to see. 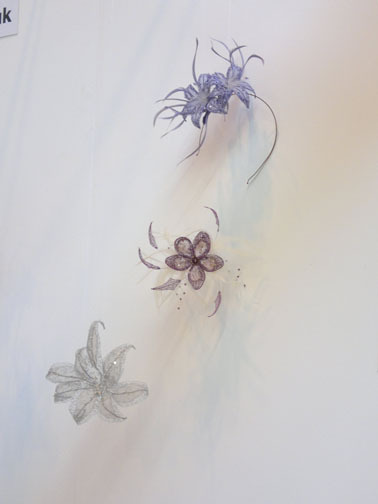 The Portsmouth College stand will be next to Cherrilyn Tylers student's work - that will also be amazing - it is going to be such a fabulous show - the best yet I think! more on Saturday . . .
Well I made it back from Glasgow on Monday, I am very glad I went. 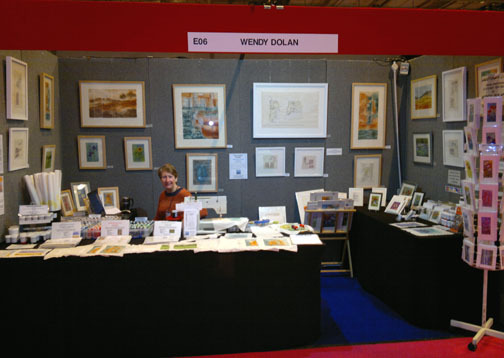 Everyone was very supportive and helpful without making a fuss, particularly Wendy and Rob Dolan. It was great to be surrounded by so many friends. If I had stayed at home and had had to cope with the new round of delights from the shingles I would have been very miserable indeed! 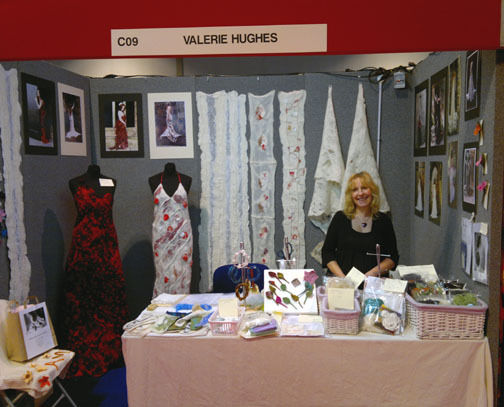 The show was very busy and everyone I spoke to seemed to think it was the best show we have done at the SECC. We had a great evening out at The Grosvenor Cinema in Ashton Lane. We saw 'The Artist' and had some fabulous food in the cafe that is part of the this wonderful old building. Isobel Hall was also at the show demonstrating how to make her lovely bags and book covers. It was great to see her and Eric and again. I stayed with them in their home in Spain over the New Year - it was an idyllic 2 days. I was SO well looked after. Thelma Judge was at the show. 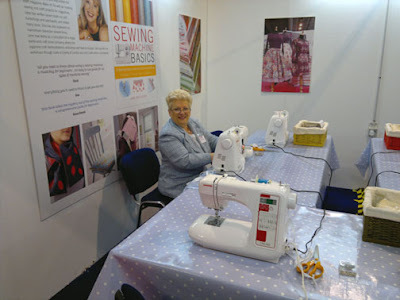 Thelma was running classes on basic dressmaking techniques and will be doing something similar at Fashion, Embroidery and Stitch at the NEC next week. I will be posting about that show in a few days. It is always exciting travelling around the country and meeting new people. 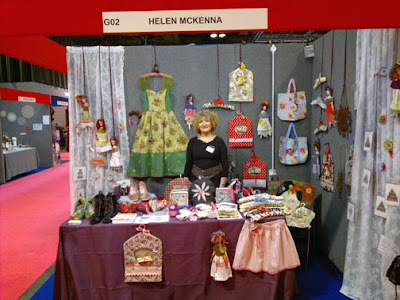 I had never met Helen McKenna before and she has the most beautiful work using recycled materials. 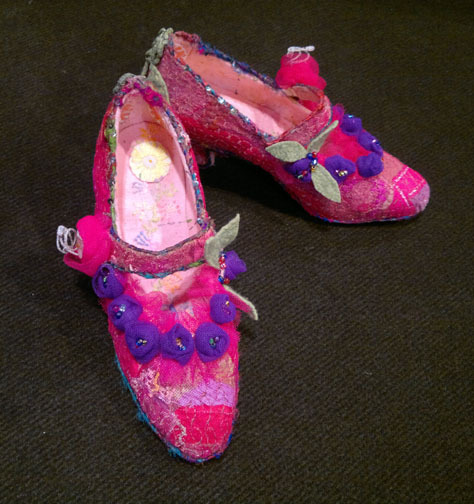 These shoes were divine . 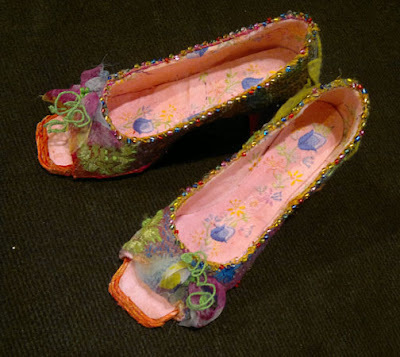 . .
. . and the heels - FAB U LOUS! It going to be an amazing show and I will tell you more in a couple of days whan I have caught up with myself. My thanks to all you who have sent me messages of support and specail thanks to Jill who sent me a very 'Delicious' book to cheer me up. I forgot to take a photo of the stand before I left - so here is one I prepared earlier - at Bluewater in February. Well I'm here in Glasgow and not tooooo worse for wear! I drove up as far as Carlisle yesterday and then onto Glasgow this morning. I had the stand more or less set up by 3pm so came back to my Travelodge for a snooze. It was great to see so many friends at the show. Wendy and Rob Dolan are here, we are off to see 'The Artist' tomorrow night. We are staying in the same Travelodge so Wendy can look after me - bless her, she is such a good friend. Isobel Hall, Jenni Rayment, Val Hughes are also here, amongst others. Cardonald College has the stand next to mine and it is looking good. 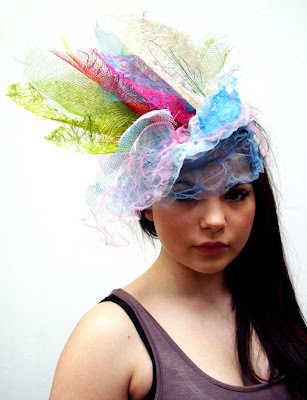 The college are hosting the fashion shows over the next 4 days and they promise to be brilliant. I love coming up here - we always have a great time, everyone is so friendly. It will also be good to catch up Kathy Troup on The Embroiderers Guild stand, we don't often see each other as we live opposite ends of the country so we will be able to have a good natter. 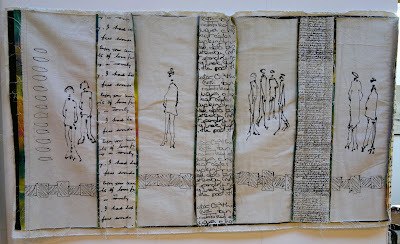 If you are coming to the show I am on the back wall - stand no F05. Do come and say Hello! I am giving a lecture everyday at 11.30am. More about the show later in the week. Missing persons, friends and stuff! 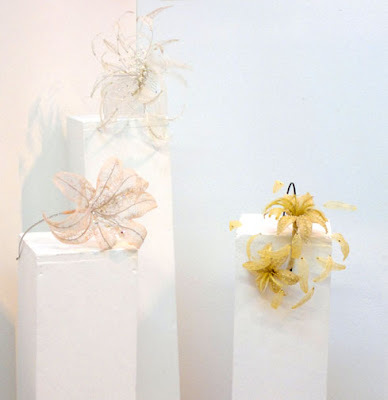 I need your help - I need to contact Laura Manning whose students work I featured on the blog last year. I have very cleverly lost her email address. If you are reading this Laura could you email me or if anyone knows Laura could they pass the message on? 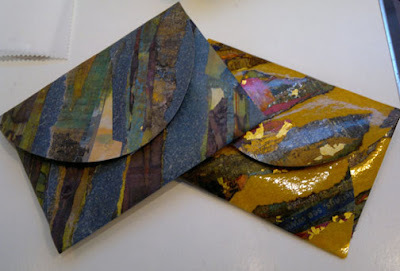 I have some very special friends - I could hear the postman trying to force something through the letterbox and low and behold it was a parcel from Chris Gray of Mabon Arts https://shop.mabonarts.co.uk/ (Chris is teaching one of the free workshops at Fashion, Embroidery and Stitch). I roared with laughter when I opened the parcel - I know Chris only sent me these packets as they would be good to melt, nothing to do with the contents . . . . the card was FAB too - Than you so much Chris! Decovil lite dyed and then decorated with some of my newspaper samples. 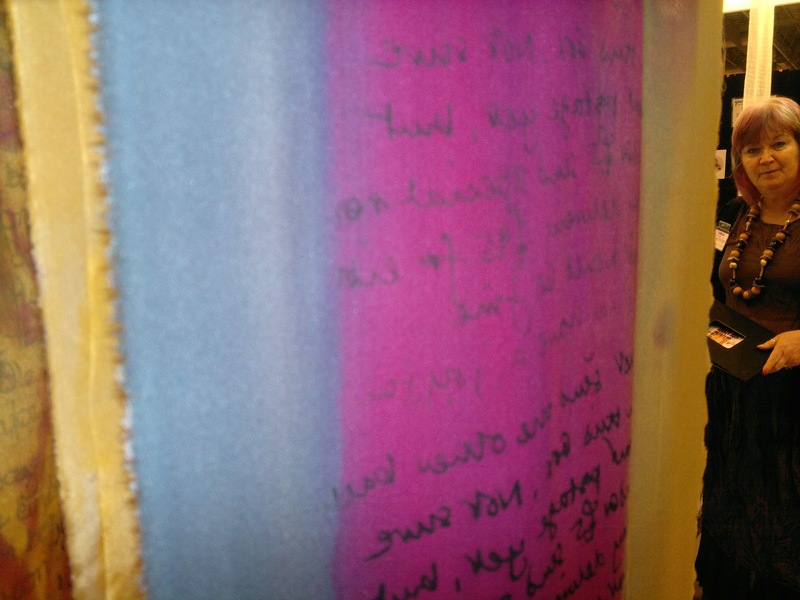 The whole sample was then covered with Lamifix - an iron on laminate. 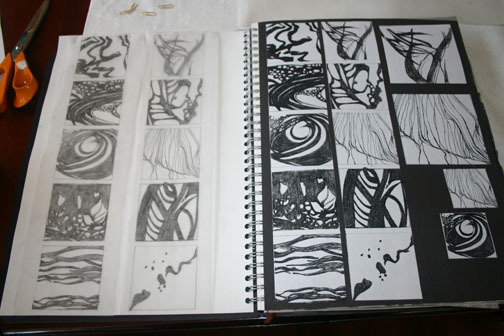 The matt is on the left and the gloss is on the right. The bags were cut out on my die cutting machine - you could easily use scissors though. 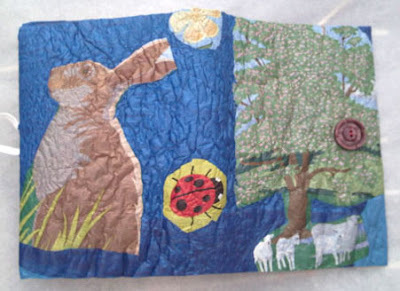 I have been meaning to tell you I have new 'Lite' version of the Decovil iron-on interfacing about to hit the website. It is slightly lighter in weight than the classic Pelmet/Craft Vilene we all know and love and it is fabulous for book covers and bag making. 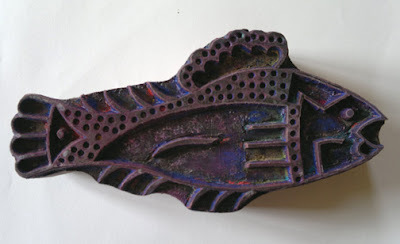 There have been several enquiries about my fishy block that I use a lot at the moment. It is one that Jamie gave me when I was printing samples for the DVD and I just love it. 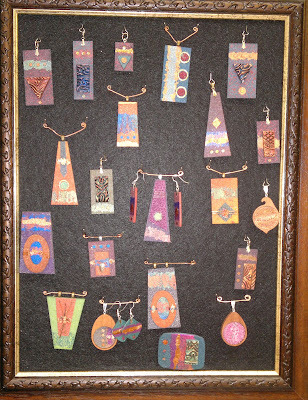 It was from a special edition that Jamie's company http://www.theindianblockcompany.com had a few of - I believe there are 20 left. Jamie is is going to put them onto the main stock after Easter and more are being made, so if you want one of the 20 - enquire soon. 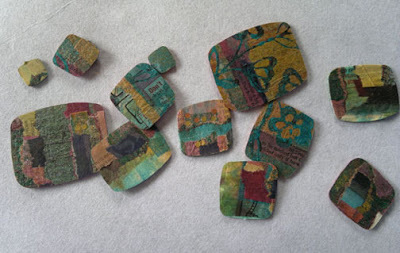 I have been playing with my die cutting machine and have cut up the samples I made earlier in the week. 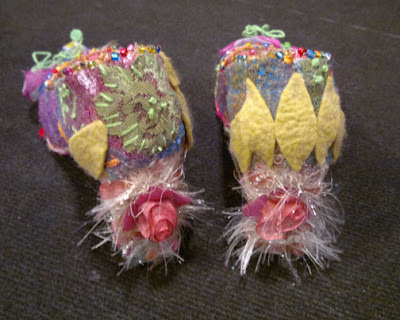 I hope to make them up into brooches and earrings over the weekend. Nice try - but no coconut!